Went Fishing, Caught 4 Deer!!! This story has been circling the internet since last year. We like to thank KenMac for submitting it recently to CNBNews. Posted on October 11, 2011 on Facebook by Second Chance Ranch. Some fish tales are hard to believe. But Tom Satre has the photos to back up the story. 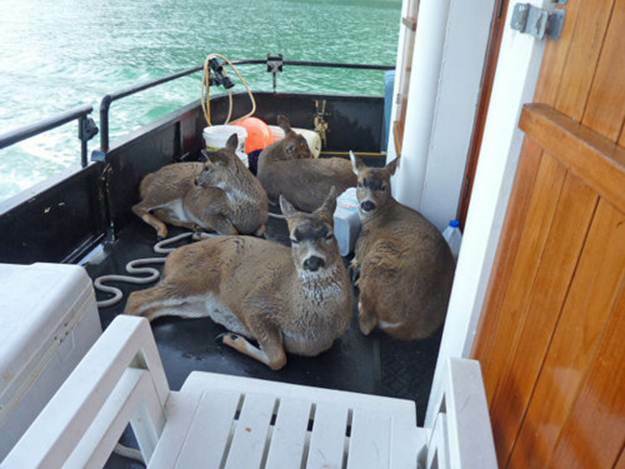 Satre told a reporter in Corvalis, Ore. that he was out with a charter group on his 62-foot fishing vessel when four juvenile black-tailed deer swam directly toward his boat. A once in the history of mankind kind of thing! Some fishing stories are a little hard to believe, but this guy has pictures to prove his story… I’ve heard of salmon jumping into boats, but never anything quite like this… Tom Satre told the Sitka Gazette that he was out with a charter group on his 62-foot fishing vessel when four juvenile black-tailed deer swam directly toward his boat. 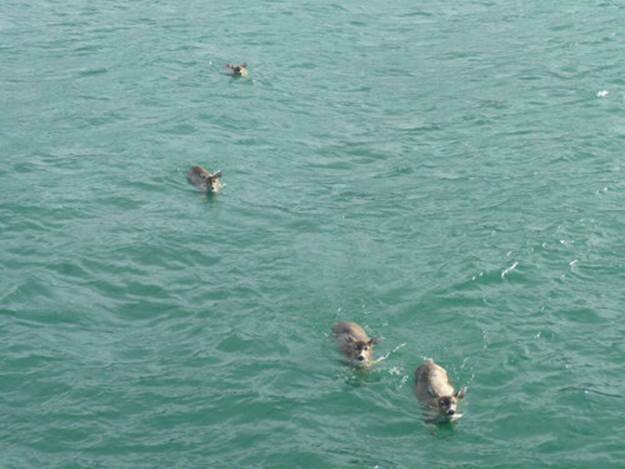 “Once the deer reached the boat, the four began to circle the boat, looking directly at us. We could tell right away that the young bucks were distressed. I opened up my back gate and we helped the typically skittish and absolutely wild animals onto the boat. In all my years fishing, I’ve never seen anything quite like it! 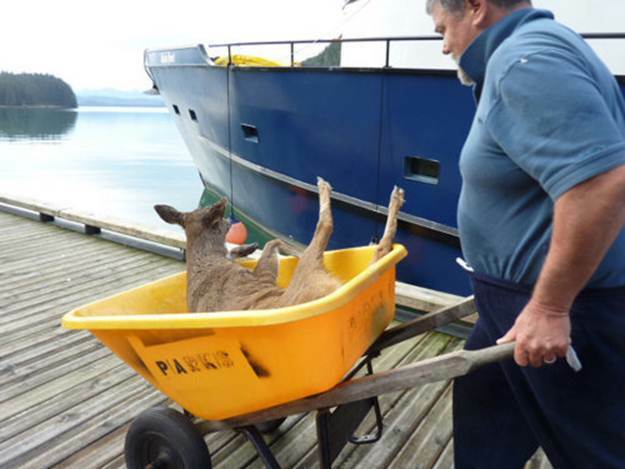 Once onboard, they collapsed with exhaustion, shivering.” “This is a picture I took of the rescued bucks on the back of my boat, the Alaska Quest. We headed for Taku Harbour . 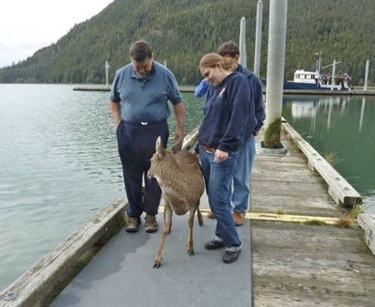 Once we reached the dock, the first buck that we had been pulled from the water hopped onto the dock, looked back as if to say ‘thank you’ and disappeared into the forest. I told you! Awesome… huh? Our Lord works in mysterious way..
NH Hunter Gored By Deer Says "It Was Going To Take Me With It"